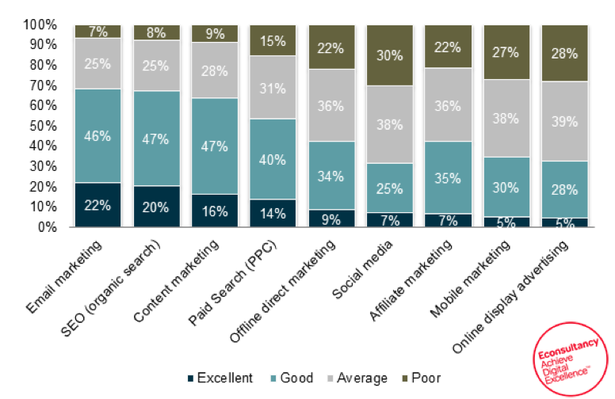 Forget the naysayers, email marketing was ranked as the best channel in terms of return on investment, with 68% of companies rating the channel as ‘good’ or ‘excellent’. This marks a 3% increase since last year, while the previously highest ranked digital marketing channel, search engine optimisation, dropped 8%, possibly due to the effect of ‘not provided’ keyword data. 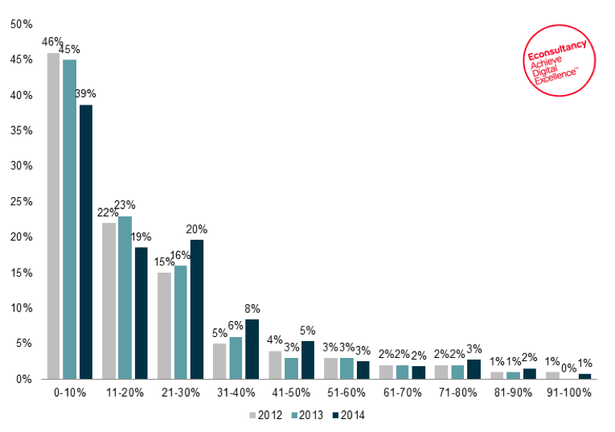 Marketers are also gaining more revenue from their email marketing efforts. Two years ago, nearly half of respondents attributed less than 10% of their total sales to email marketing. This year, that figure has dropped to 39%, a 19% drop in two years. By comparison, nearly a quarter (24%) of respondents attribute 30% or more of their sales to email marketing, up from 18% two years ago. Q: Approximately what proportion of your total sales can you attribute to the email marketing channel? However, companies are spending just 16% of their marketing budget on email. Yet again we can see that email is an extraordinary channel for delivering ROI. The danger for buyers of marketing technology is that they increase spend on email assuming continued growth in return. The danger for vendors is that they attempt to capture a greater proportion of the budgets available without providing real return. Email generates fantastic results for those who are making the time to adapt their marketing practice to the changing expectations of their customers. One proven way to boost ROI is to make use of functions such as personalization, automation, dynamic content and mobile optimization. The report shows that there is a trend where email ROI increases markedly with increased use of email platform functionality.